Now available as a wall poster! 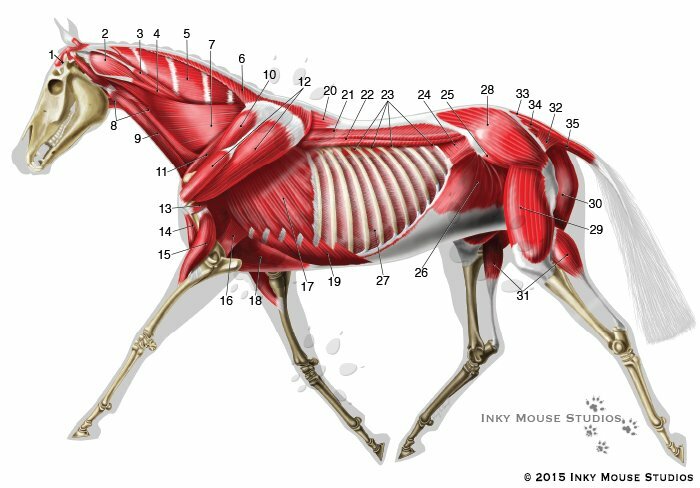 This custom veterinary anatomical illustration of the equine deep musculature features a lateral view of a horse in motion rather than the usual standing pose, since the client it was created for works with performance horses. This image includes the deep musculature of the horse, as well as the skeleton, ligaments and tendons which are associated with it. There are two other illustrations which are associated with this illustration, one of the superficial musculature of the horse, and another of the skeletal system of the horse. This is one of a series of three images originally created for Equestricare in Australia, which is a company specializing in equine sports medicine and massage therapy for these amazing athletes. 1. Temporalis, 2. Rectus capitis ventralis cervicis, 3. Longissimus capitus, 4. Longissimus atlantis, 5. Complexus, 6. Rhomboideus, 7. Serratus ventralis cervicis, 8. Omohyoideus, 9. Sternocephalicus, 10. Supraspinatus, 11. Subclavian, 12. Infraspinatus, 13. Teres minor, 14. Biceps Brachii, 15. Brachialis, 16. Transverse pectoralis, 17. Serratus ventralis thoracis, 18. Ascending pectoralis, 19. Oblique abdominal externals, 20. Spinalis dorsi, 21. Longissimus dorsi, 22. Longissimus costarum, 23. Serratus dorsalis posterior, 24. Transversus abdominus, 25. Iliacus, 26. Oblique abdominus internus, 27. External intercostal, 28. Gluteus medius, 29. Quadriceps femoris, 30. Semimembranous, 31. Gastronemius, 32. Coccygeus, 33. Sacrocaudalis dorsalis medius, 34. Sacrocaudalis dorsalis lateralis, 35. Sacrocaudalis ventralis lateralis.